This hibiscus tea kefir fizz is a type of water kefir drink. Water kefir is a fermented drink made with water kefir “grains” which are actually a complex polysaccharide matrix, in which live a combination of live bacteria and yeasts or SCOBY (symbiotic culture of bacteria and yeasts). Similar to milk kefir grains, these are used to make a fermented drink with sugar water, juice, teas or coconut water. The beneficial bacteria and yeasts present in the water kefir grains metabolise the sugar, and in the process convert it into a drink with beneficial acids, probiotics, B vitamins as well as food enzymes and minerals. It is a delicious, natural and healthy way of getting probiotics. Kefir grains starters can be found in health food stores – do not use milk kefir grains for water kefir, nor use kefir powder. For other questions on kefir water click on this site which has some good FAQs. Avoid metal utensils, including strainers when making water kefir. Use glass, wood, cotton muslins and plastic. Remember that fermented foods should have a slightly sour but clean smell and taste. Don’t consume anything that tastes bad to you or that is mouldy. Most kefir waters go through 2 fermentation stages but I made this recipe using the hibiscus tea instead of the plain water in 1 fermentation. I have, however, included the 2-step fermentation process for those who want to try different recipes. The second fermentation is usually used to flavour the drink with juices, berries or other and to give it carbonation (bubbles) but I found that you can get plenty of carbonation in a first infusion so it was unnecessary. The following recipe makes 1 litre but you can double amounts as necessary. Hibiscus flowers are delicate and best infused in warm water then left to infuse in 12-hour increments at room temperature or int he refrigerator. Pour the 1 litre of warm water into a pitcher with the 3 tablespoons of dried hibiscus flower and leave to infuse at least 12 hours. I infused mine for 32 hours because I wanted a very concentrated infusion. 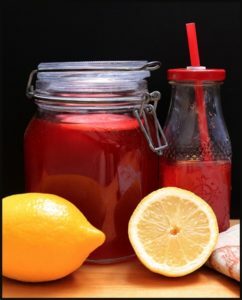 To brew water kefir, you’ll need a jar with a loose fitting lid or a bit of cotton muslin to cover the jar. I used a 2 litre mason jar with a square of muslin held with a rubber band. For the secondary fermentation, you can use flip-top bottles instead or a glass jar with a tight lid. If you do the 2-step process, warm 1 litre of water (or if it is summer and warm enough, room temperature will do) and stir in the sugar until it is completely dissolved. Allow it to cool to room temperature. If you are using the hibiscus infusion, stir in the sugar directly until it is dissolved. Ensure that if you have refrigerated the infusion it is at room temperature. Place the water kefir grains (without their resting water) into the large glass jar, ensuring you don’t use metal to touch them. Pour in the sugar water or the hibiscus infusion, and drop in the figs and lemon. Cover the jar with the muslin secured with cooking twine or rubber band to allow air in but to prevent stray debris from spoiling your water kefir. Allow the water kefir to ferment for 24-72 hours. Because it is very hot at the moment I only fermented mine for 48 hours and that was plenty for both carbonation and a really nice flavour. Usually the longer it ferments, the stronger its flavour will become, but a general rule of thumb is that when it is ready the figs will float to the top (though you can continue the process for longer). Strain the water kefir through a nonreactive (plastic, wood or muslin) strainer into a pitcher or glass bottle. Discard the spent lemon and figs, but reserve the water kefir grains which can be immediately re-cultured or can be stored in a sugar water solution in the refrigerator. They do not need to be rinsed and in fact this can weaken them. Store the water kefir drink in the refrigerator and drink within 7-10 days. An initial fermentation without the hibiscus tea will taste light a slightly sour lemony fizzy drink. After its initial fermentation, you can also choose to ferment it a second time to flavour the water kefir further, and the secondary fermentation process, which occurs in a tightly capped bottle, allows carbon dioxide to develop, producing a fizzy water kefir. As per above, I find that this happens int he first fermentation anyway and is sufficiently carbonated for my taste. For the secondary fermentation, pour either the fruit juice of your choice, the tea infusion or the organic cane sugar into flip-top bottles or jar. Then pour the water kefir from the pitcher into the bottle or jar, filling it within 1-2cm of its opening. Seal the bottle or jar, and set it on your countertop to ferment a further 12 to 24 hours, keeping in mind that warm temperatures will speed up the fermentation process while cool temperatures will slow it down. Transfer the bottle/jar of water kefir to the refrigerator for 3 days to allow the bubbles to set. Open carefully over a sink, since the liquid in the bottle/jar has pressure, and when you release the bottle/jar’s seal, the water kefir may fizz and foam. These amounts can be doubled and so on for larger batches.